TO REDEEM OFFER: Add qualifying in-stock full-priced PINK item(s) totaling $10 USD or more to your shopping bag. Enter offer code MINIDOG at checkout. 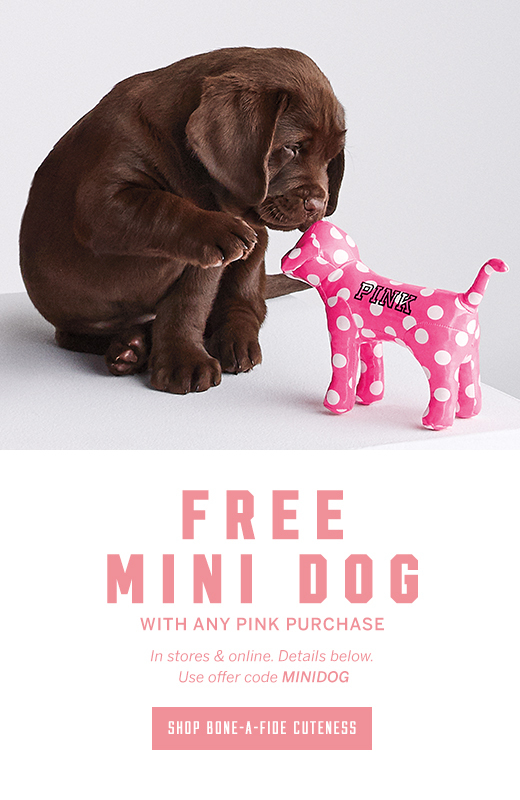 Your free PINK Mini Dog will be added to your shopping bag after offer code is applied (one free mini dog per order). Valid March 23, 2019 through March 25, 2019 at 11:59 pm PT; while supplies last. OFFER EXCLUDES THE FOLLOWING: Victoria's Secret Lingerie and Beauty, clearance (items with prices ending in $.99), gift cards, gift wrap & kits, store and previous purchases, shipping & handling and taxes do not qualify toward offer eligibility. Not valid with any other promotional gift with purchase offers. ADDITIONAL OFFER DETAILS: No substitutions. Discount cannot be redeemed for cash or used as payment toward your Victoria's Secret Angel Credit Card. Offer subject to adjustment due to returns, cancellations and exchanges. Shipping and handling does apply to free product. Offer may be modified or discontinued at any time without notice. TO REDEEM OFFER: Add 2 or more qualifying in-stock PINK Bras to your shopping bag. Enter offer code PINKBOGO at checkout. The price of your lowest priced PINK bra(s) will be adjusted after code is applied (discount applied in multiples of 2). Valid March 22, 2019 through March 24, 2019 at 7:59 pm ET; while supplies last. 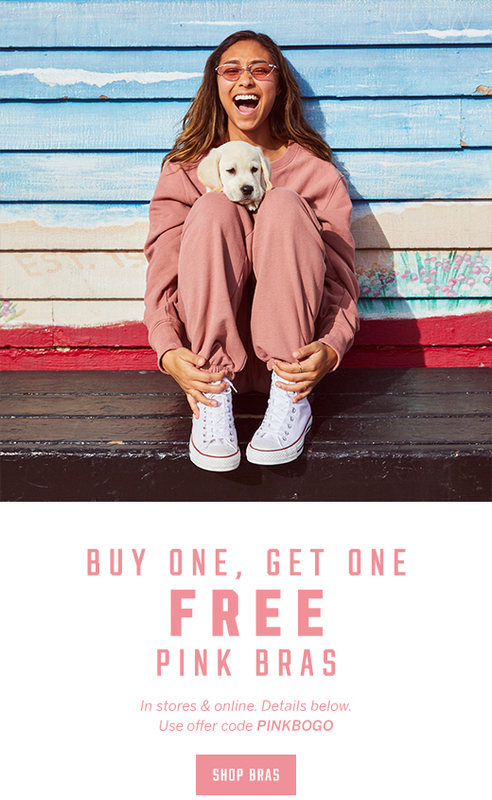 OFFER EXCLUDES THE FOLLOWING: Victoria's Secret or Victoria Sport bras, clearance (items with prices ending in $.99), Victoria's Secret designer collaboration products, previous and store purchases. Not valid with other bra offers. ADDITIONAL OFFER DETAILS: No substitutions. Offer subject to adjustment due to returns, cancellations and exchanges. Orders shipping outside the US may not be eligible; additional taxes and duties may apply. Shipping and handling applies to free product. Offer may be modified or discontinued at any time without notice.